Guest, Lady Charlotte, trans. 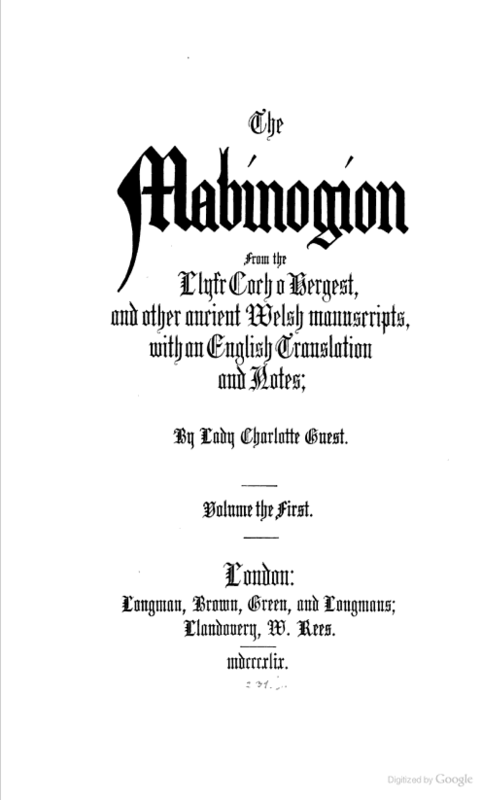 The Mabinogion from the Llyfr Goth o Hergest and other ancient Welsh manuscripts, with an English translation and notes. 3 vols. London: Longman, Orme, Brown, Green, and Longmans; Llandovery, W. Rees, 1839–49. Provenance: Morris (purchased for £8 1s. 15d.). — Richard Bennett. — Sotheby 1898, lot 422 (sold to Quaritch for £3). — Unlocated. References: MS catalogue (1), fol. 13v. — MS catalogue (2), no. 379. Digital version: Google (vol. 1, vol. 2).